(Newser) – A grieving family is accusing Chicago cops of attempting to cover up the murder of their 18-year-old son after the police department released nine videos Friday showing the final moments of Paul O'Neal's life, the Los Angeles Times reports. O'Neal was driving what police say was a stolen car when officers opened fire on the car in the middle of a neighborhood on July 28. O'Neal got out of the car and ran; an officer chased after him and shot him in the back when he didn't stop. 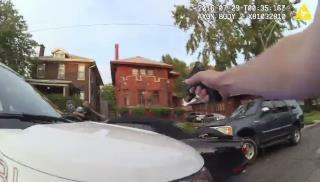 According to WLS, the body camera of the officer who shot O'Neal wasn't functioning. It's unclear why. But the cameras of other officers arriving on the scene were rolling. Crime is not a safe career...hard to feel sorry for someone who put themselves in those circumstances. No different than if he stole the vehicle and drove it into a tree. Bingo Sam H. Just like the guy in Baton Rouge. Why was he armed? He was a convicted felon. Why was he slanging bootleg CD's in front of that store so late at night? Another "fine young man" taken from us in the prime of life. Nah. . .just another low-life criminal stealing a car and being killed in the process. Here is a thought. . .do not steal cars and perhaps such incidents would not happen to you.